I may or may not have a problem with our ice maker. We don’t get along terribly well and he’s often jamming on me. This is totally his fault and not mine. Because of said jamming, I had a boat load of ice to get rid of …. But wait. 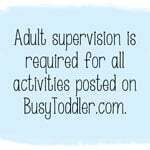 Toddler activity? Could I find a way to make this into a legit activity so I can blow this jamming incident off as something I meant to do?! 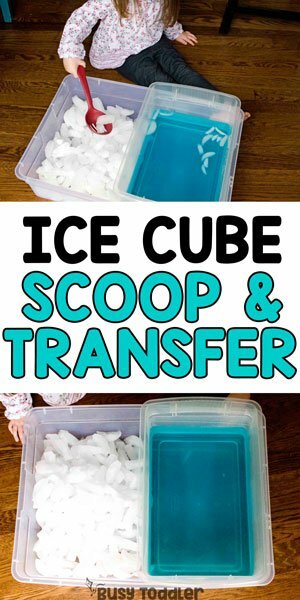 YES PLEASE ICE BIN TRANSFER! Ever wish you had daily activities ready to go for your child each day? Well I did. So I wrote Playing Preschool: 190 Days of Activities. And that’s how Ice Bin Transfer was born. 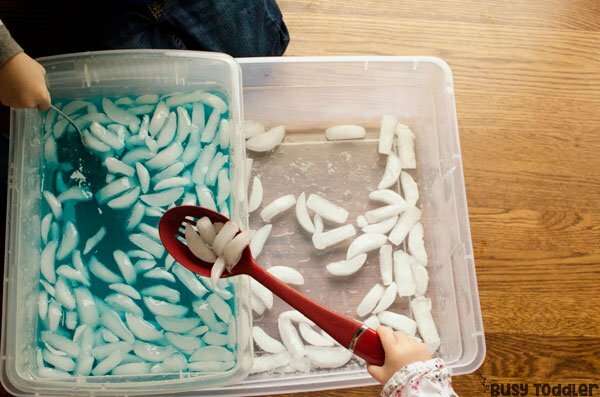 I took two clear plastic tubs to make this activity. It’s always good to have a few options in sensory bin tubs aka those storage containers you shove under your bed and never look at again. I may have something like 5 stashed around our house for activity reasons – everyone has something they hoard, right? So I grabbed two bins of different sizes. I filled the smaller container with water and dyed it blue because, well just because. It felt like the right thing to do. I set that smaller container of blue water into the larger bin – think “double bagging” but double binning. I dumped all the ice in the now open space of the bigger bin – right next to the water bin. See pictures if you’re like me and a total visual learner. These written directions are a little wonky. And now it’s time to play Ice Bin Transfer! 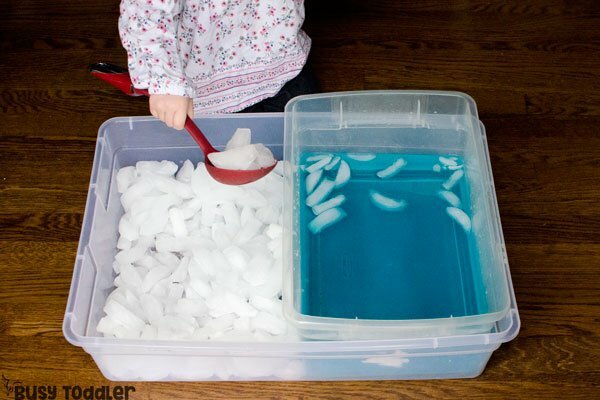 The job for my 3 year old was simple: scoop and transfer the ice into the water bin. 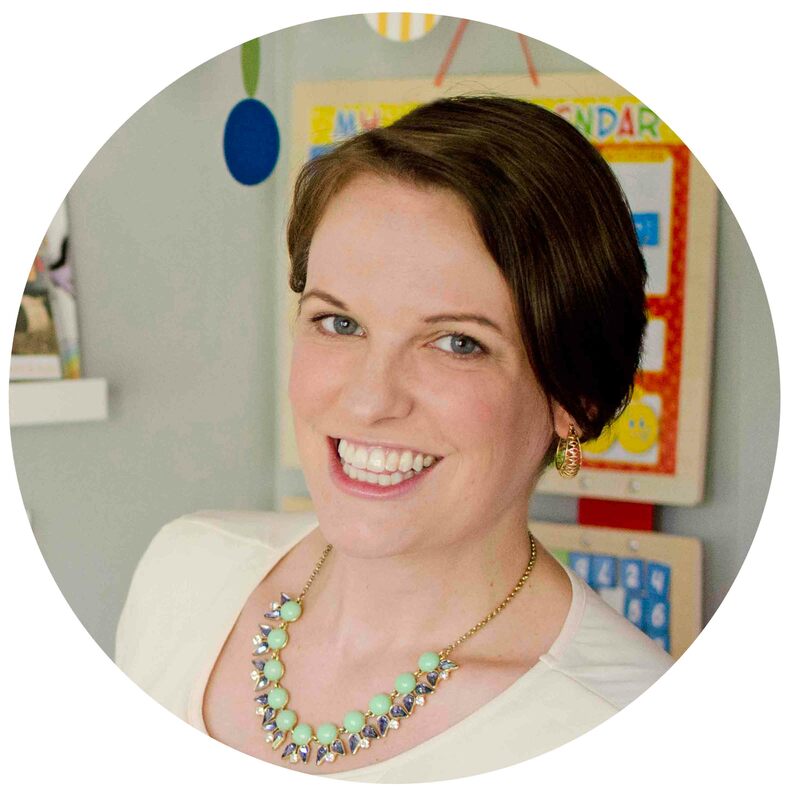 Toddler activities don’t have to take hours to set up or cost tons of dollars to get going. They can be easy and brilliant. 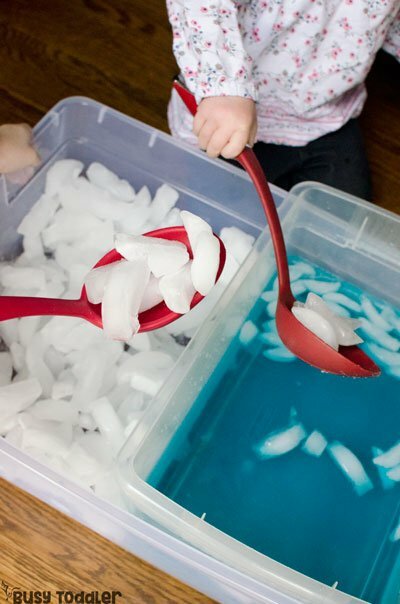 Ice and a ladle. People. 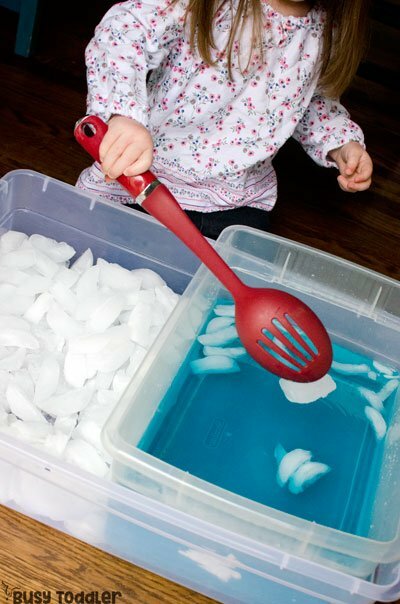 Ice and a ladle and my toddler was entertained for 20 minutes. Because she did the activity in reverse next. After she finished scooping the ice into the water bin, I had her do it all again – but backwards. 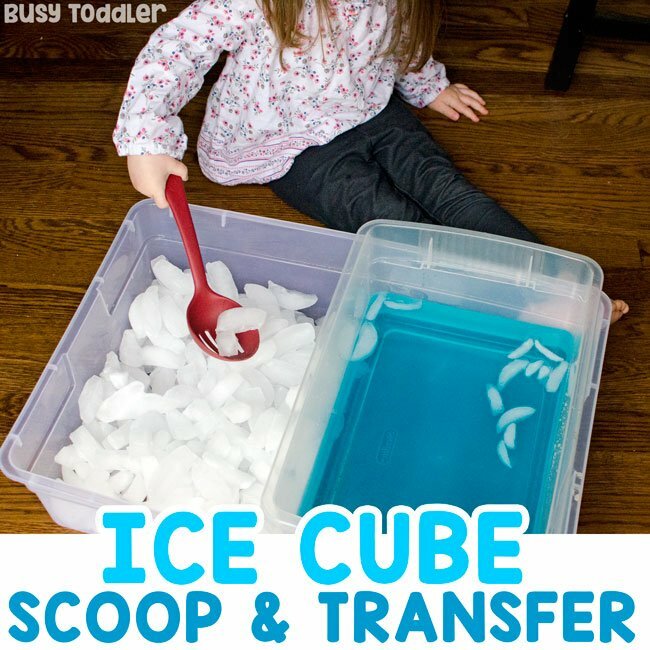 Now scoop the ice that’s in the water bin back into the empty side. She did it, then transfer everything back to the water one last time. After that – I opened the bin up to any and all free play which meant her Paw Patrollers ended up all over that ice on some super important rescue mission. 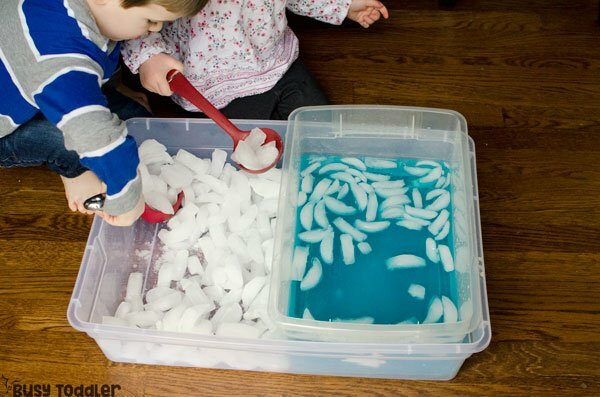 My kids always have fun playing with ice. So I may have jammed the ice maker but the ice maker ended up getting me out of a jam by entertaining my toddler. We’ll call it a win-win situation. 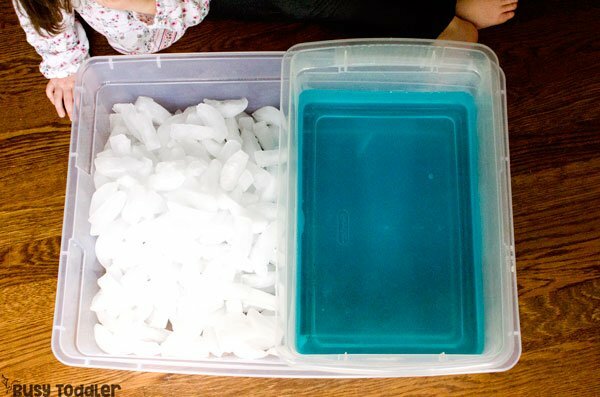 When will you build an ice transfer bin?